Today I have spent a lot of my time waiting. I shall explain why shortly, but in the meantime, this unfortunate – but very necessary – recess in my diary has served-up a few hours to think about stuff. Usually, I always take my laptop, my phone, a note pad, headphones, wallet and keys wherever I go. But today I left home with just my keys and wallet. Downtime. A chance to reflect. 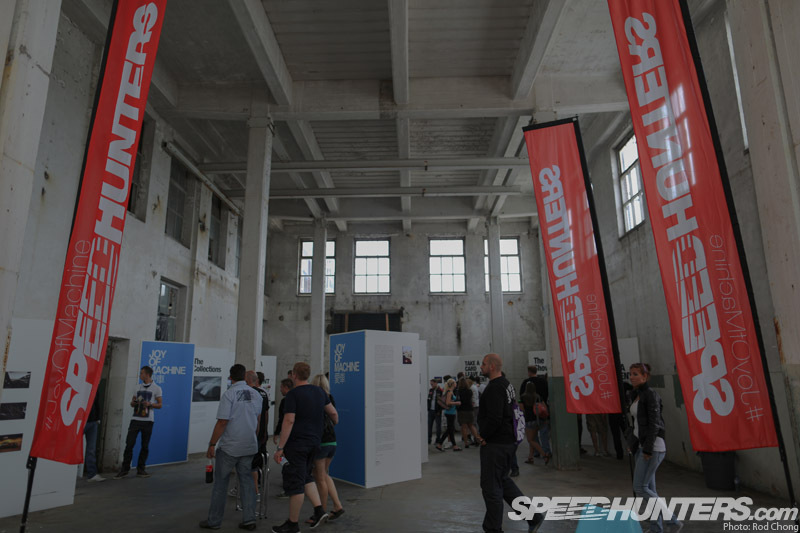 Not just on the weekend of show happenings over in the Netherlands, but also a chance to think about the past few months of Speedhunting in general. The theatre for the recent DMPD Show in the Netherlands was to be the old ENKA Factory, in a place called Ede. Neatly positioned about an hour or so drive away from Amsterdam, the show was taking place on a Saturday and would see people travel from France, the UK, Belgium, Germany and even Spain, for the well organised event. Paddy, as usual, travelled from Ireland. He had spent 13 hours driving on the Thursday to get to London, which is where we both set off from on Friday morning. Arranging to meet somewhere on the way to the Eurotunnel, Paddy was spectacularly early which resulted in us being united at a Shell station just a few miles before the terminal near Folkestone. Paddy’s weapon of choice was his 320d BMW E90. I absolutely love this car. It’s a perfect vehicle for devouring long journeys and Paddy has got it set-up really well. There’s room for all his camera gear in the boot, it’s comfortable and he has a mobile WiFi hotspot thing inside that basically makes this a mobile Speedhunting office. It’s a great vehicle for work, but it’s also a lot of fun, too.With chassis upgrades from KW Automotive and BMW Performance Brembo brakes fitted up-front, plus a software upgrade to the ECU, the Munich mile muncher is also ready to do battle on twisty roads as well. I think the choice of 3SDM wheels with BMW centre caps gives a stylish almost-OEM twist to the car. 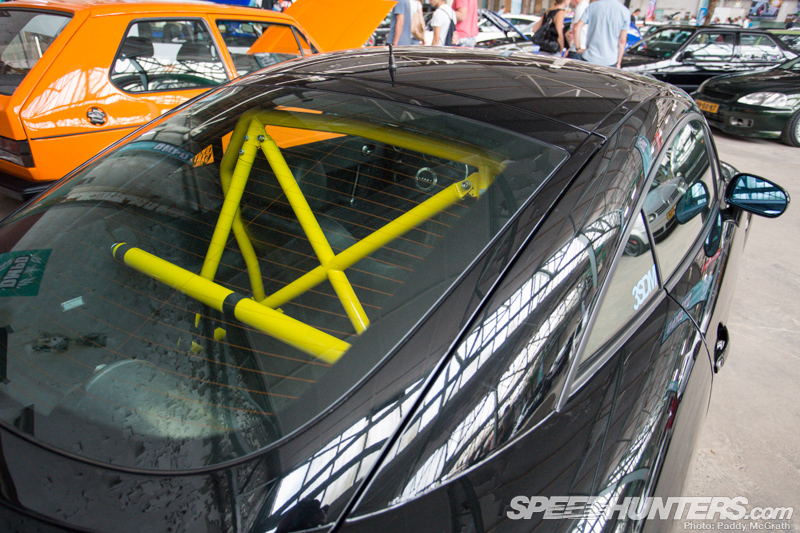 There’s also loads of neat touches like the carbon fibre boot lid that keep you looking around the car, too. Anyway, enough of Paddy’s E90! My vehicle for this adventure was to be a Volkswagen Beetle which also has 2.0-litre TDi power. I liked the lines of the latest Beetle and picked this car up in December last year. The VW has chassis upgrades from Air Lift Performance featuring its latest threaded body system with V2 management for full ride height adjustability on the move. There’s also a Forge Motorsport braking system up front. 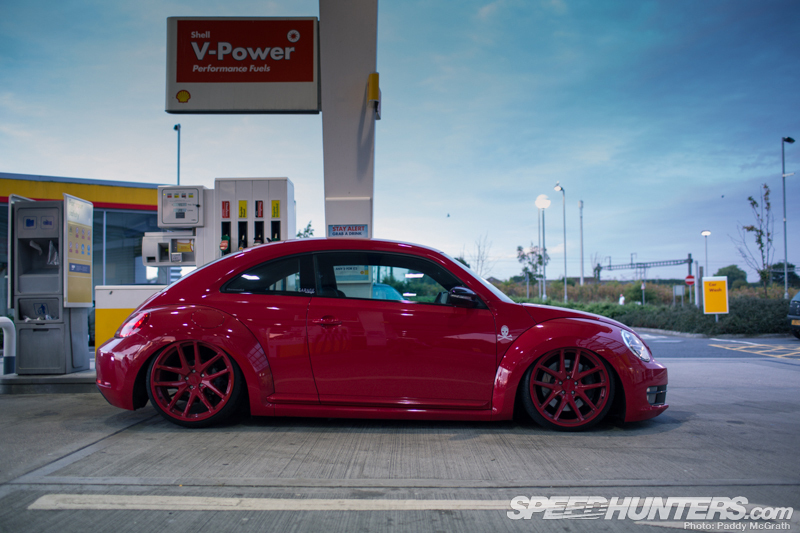 The paint is a classic VW hue known as Tornado Red. I chose to have the 20-inch Rotiform SNA wheels colour-matched by Greg Howell the day before Players Classic at Goodwood. With a Revo Technik software upgrade installed to the ECU by my friend Ryan at Garage Midnight the day before we left, the car made 188bhp and 300lb/ft of torque on the dyno at Regal Autosport. 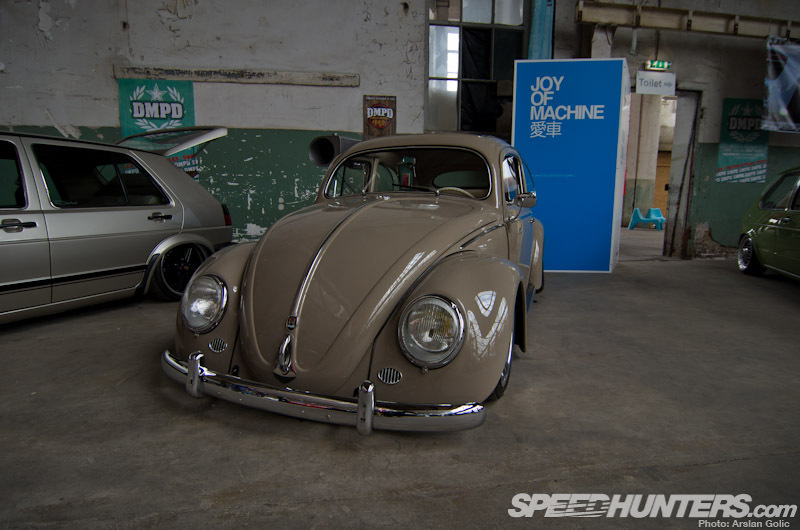 These figures were almost identical to the numbers Paddy’s BMW was making so I was interested to see how the Beetle would compare performance and economy-wise to his E90 over the distance. Whilst Paddy’s car had WiFi, the Beetle has a Kenwood system that features an awesome sat nav device that allows me to find things very easily. This would make my mission to collect Rod from Schiphol airport in Amsterdam later that evening, a simple one. 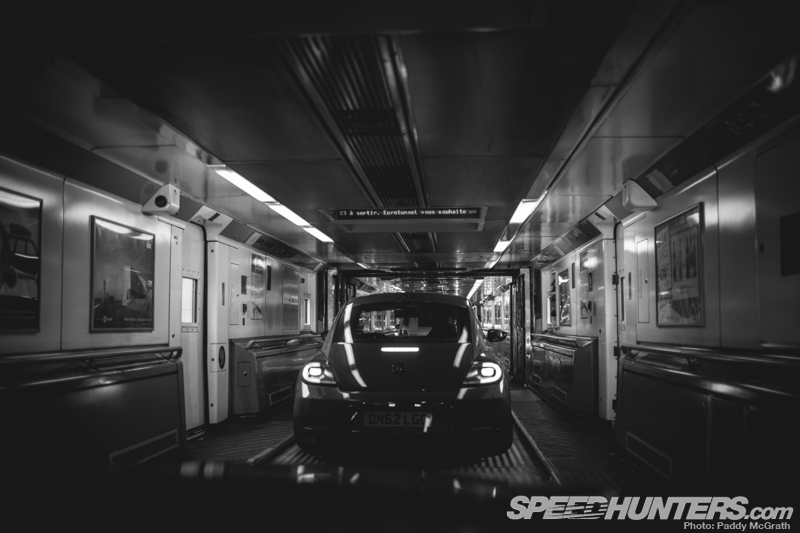 After the fuel stop, we checked our cars in and drove them onto a train that would take us under the English Channel to le France in just 35 minutes. This train thing that takes you underground is an engineering marvel. I love it. 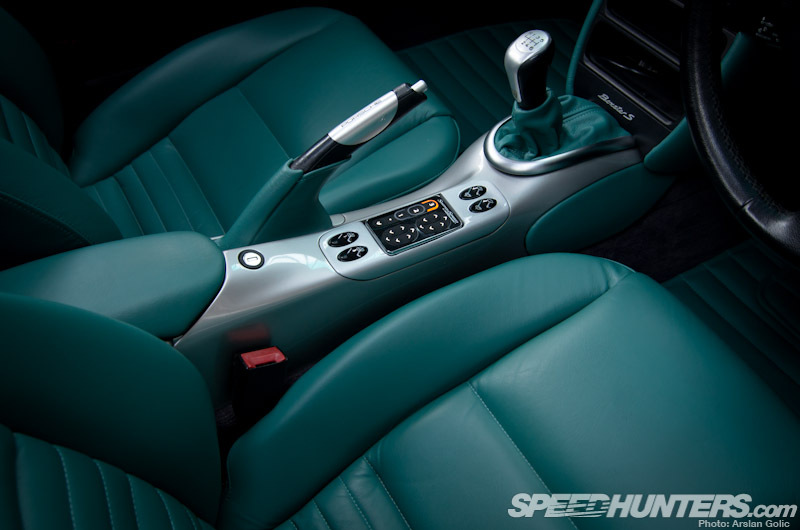 Not just because it’s fast and you don’t even need to leave the comfort of your own car, but most importantly, this transportation device is not a ferry. I hate ferries. Big boats that carry cars are slow and they smell bad. The undersea train is the most efficient way to get yourself to and from France. In fact, I’d go as far as to say that it’s the only way. This was Paddy’s first time with his own car on the Eurotunnel and, later that day, he informed me that it was his first time driving on the ‘wrong side’ of the road, too. He’s Irish, though; so I guess doing things the wrong way comes naturally. Ain’t that right Paddy? 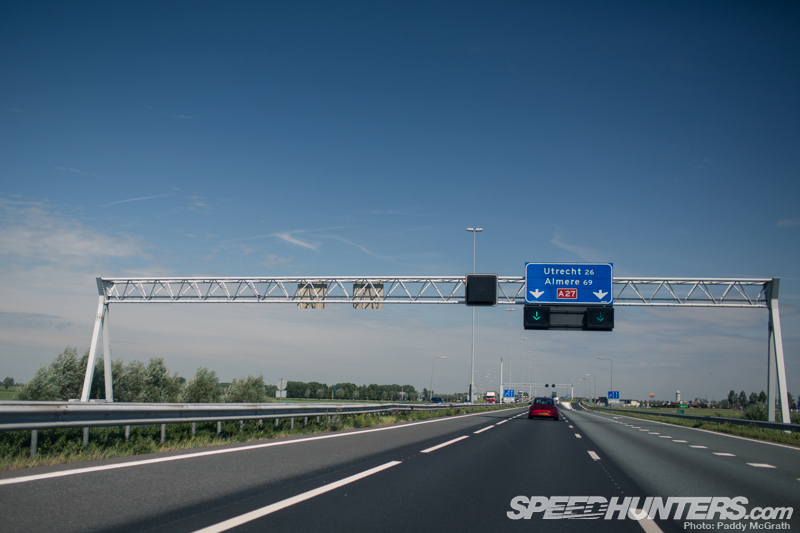 The journey from the Eurotunnel terminal in Calais to the location for DMPD in the Netherlands was only a three and a half hour drive, but it still managed to deliver some pretty incredible things to look at. 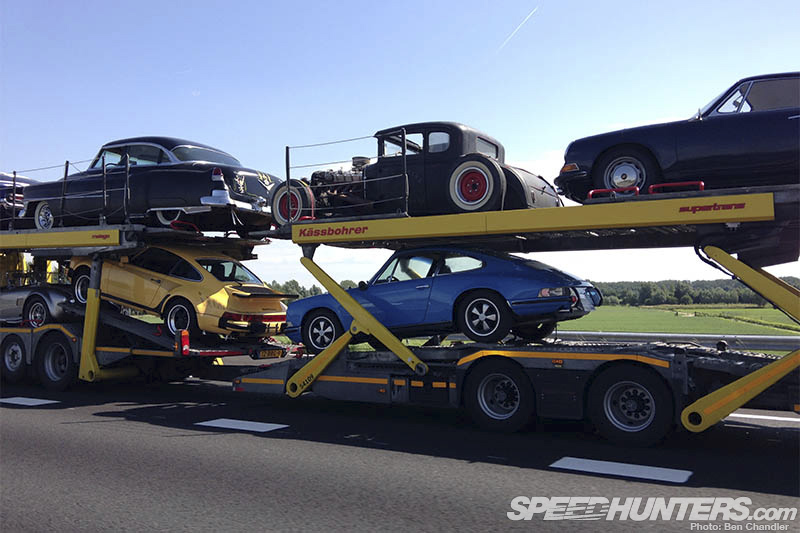 Amongst the Citroën DS models and vintage Mercedes-Benz W123 cars that we saw cruising in France and Belgium, we spotted this incredible car transporter heading northbound on the A27 near our destination. Who needs caffeine to wake you up when you come across something like this whilst stuck in traffic? 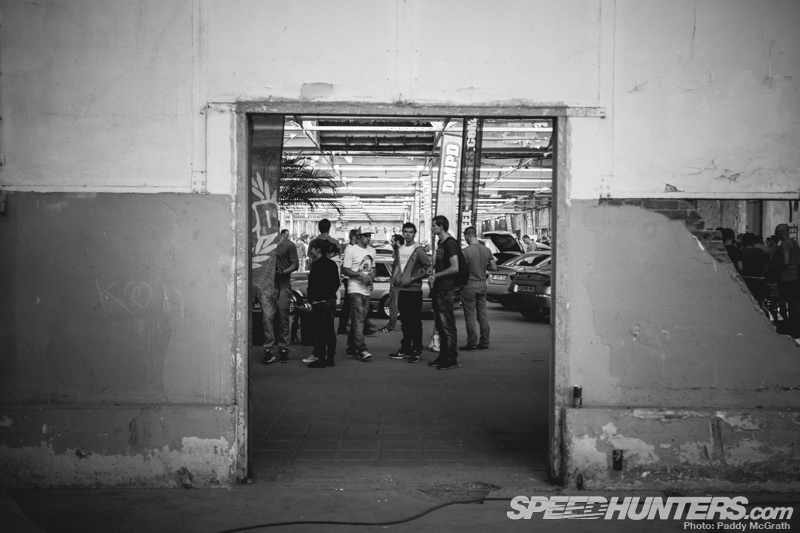 … so we headed to the hotel where a pre-meet was being held and everyone was detailing their cars in preparation for the following day. 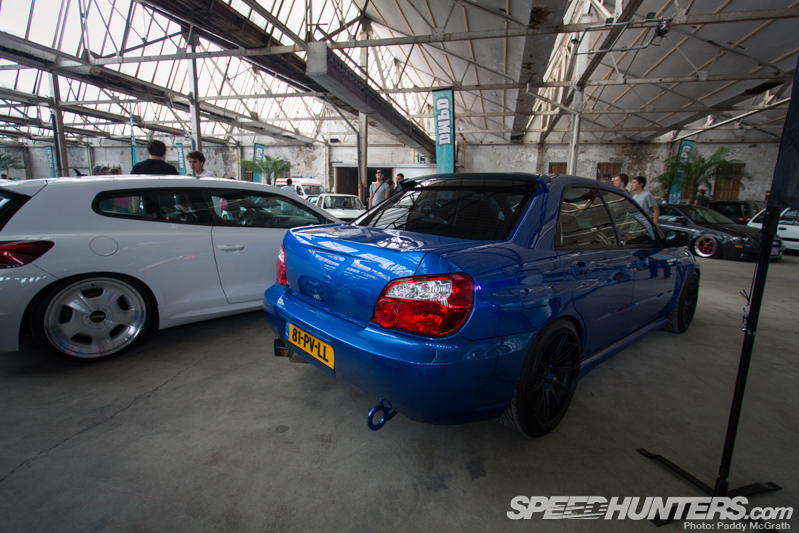 Jon Truman’s Evo looks really tight without the boot spoiler. I’ve seen this car evolve over the past few years and I love the subtle styling that accentuates the aggressive lines of the car. Some people wearing bright clothes came, but unfortunately that didn’t stop the rain. … while I headed off to the airport to pick up Rod. Cars like the Beetle and Paddy’s BMW may not be the fastest point-to-point tools, but on long European trips these vehicles make a lot of sense. With a simple stage one upgrade to the engine management, both of these vehicles boast more torque than the latest stock Golf GTI, with a range of around 600 miles to a tank of fuel. This means less stopping and more progress. It also makes the adventure more kind on your wallet. The two-hour round trip to Amsterdam was an easy one and it was time for an ill-fated McDonald’s and some sleep. The next morning I got mocked via the medium of every social media feed possible by Paddy for somehow managing to destroy my iPhone. I say somehow, but after a Big Mac meal, I accidently left it by the tailgate catch and slammed the boot down pretty hard causing damage of the fairly terminal sort. RIP trusty phone. You served me well. 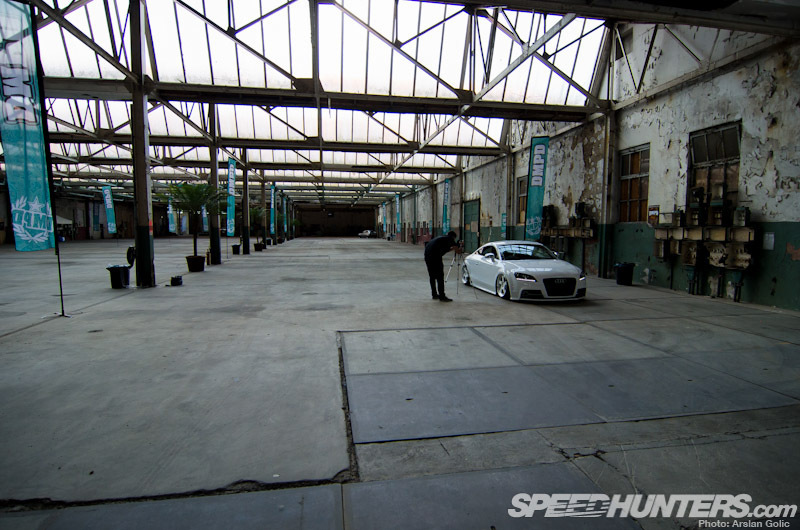 Soon the old factory started to fill up with all sorts of lovely cars. 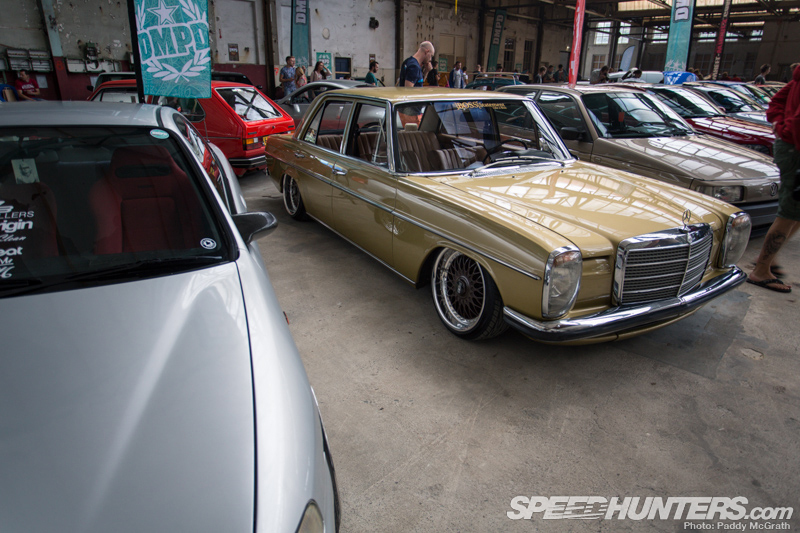 I can’t get enough of the old school Mercedes models. I’d love to own a stack headlight Benz lowered over a set of dishy BBS RS wheels. This example was a little crazy, but it had bags of character. 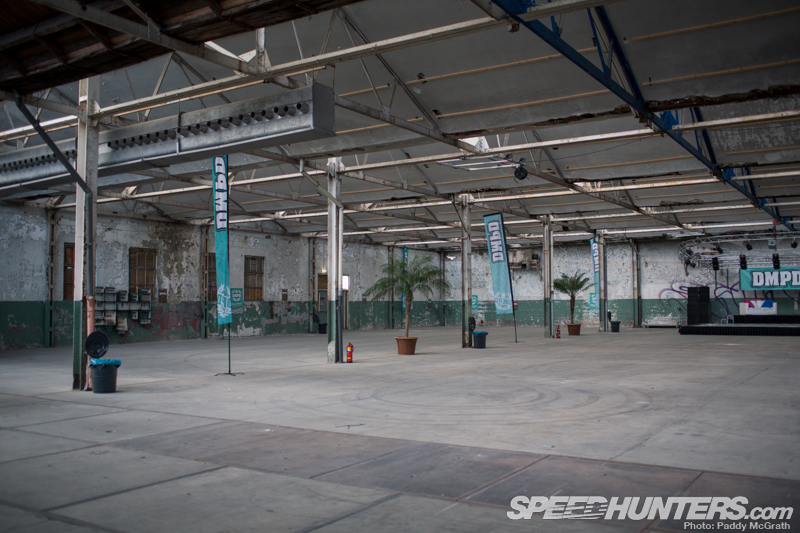 As you can see from this shot, everywhere inside the building was a great location for a photograph. Paddy and I will be bringing you some feature cars next week from this event. 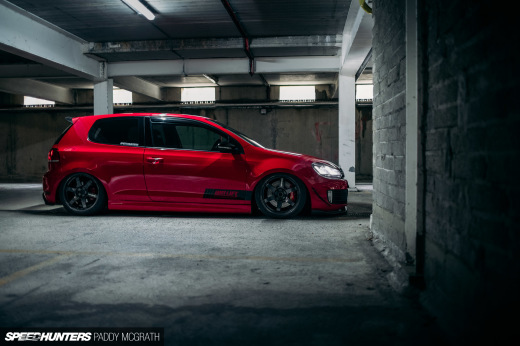 You may have seen Paddy’s #joyofmachine story that was posted yesterday. If you want to know more about this photograph above and the exhibition that went down at the DMPD event, then you can by clicking this link. It was very cool to see this come to life. The install is kind of like a newborn baby taking its first steps out into the open world and learning about life. It’s going to be great to see how the concept evolves and it’s great to read everyone’s different comments on the photographs. With the exhibition set-up taken care of, the show was in full swing, so Paddy and I set out to go and meet some of the people responsible for building these cool cars. It’s sort of strange to think that you travel to a different country to then meet new people from about a half hour away from where you actually live. 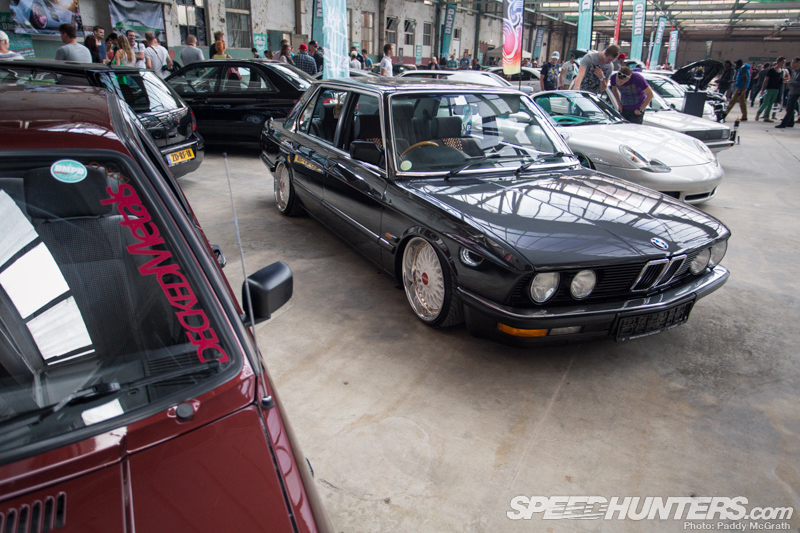 We’ll be bringing you a full feature on Luke Ward’s E28 BMW next week. … 9.25-inch wide BBS magnesium splits were fitted-up all round to keep the Mk IV R32 Haldex AWD-system happy and give a really fine look. 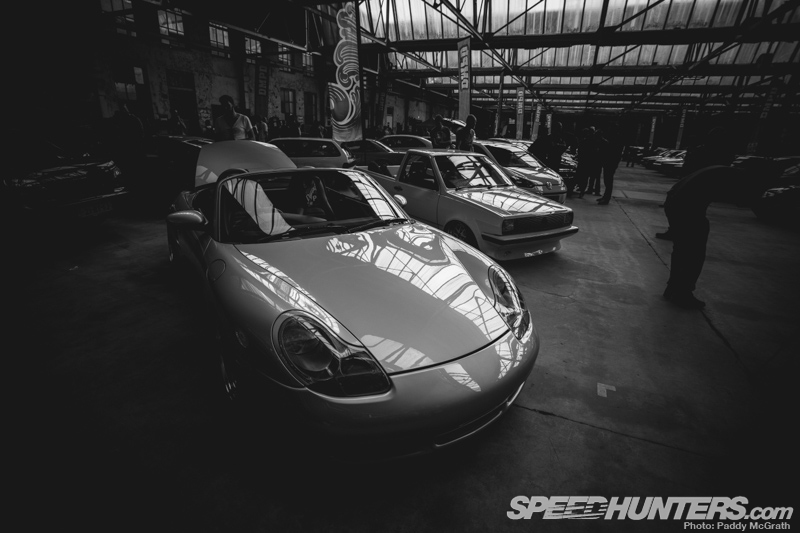 I don’t think I’ve ever been to a car show held in such a cool environment. It seems a shame that out of many factories that were once on the large piece of land, this is the only one left standing in its entirety. I’ve gotta hand it to the DMPD crew, they did a great job getting the cars in so quickly during the morning and the overall level of organisation was very impressive. The cars themselves not only looked great, but the way they had been parked made the event a real pleasure to walk around. 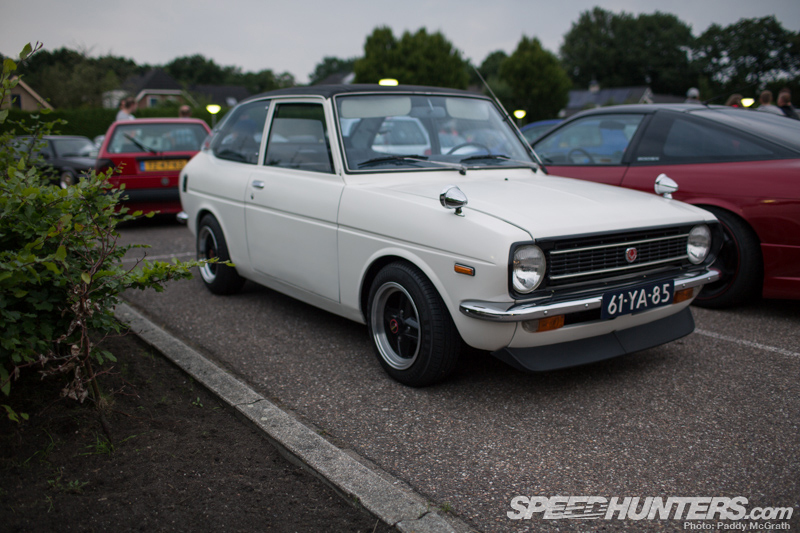 When I was a kid growing up this was one of my dream cars – a MkII Golf with big bumpers and a serious motor. I’m not sure how, but I walked clean past this without having a proper look. 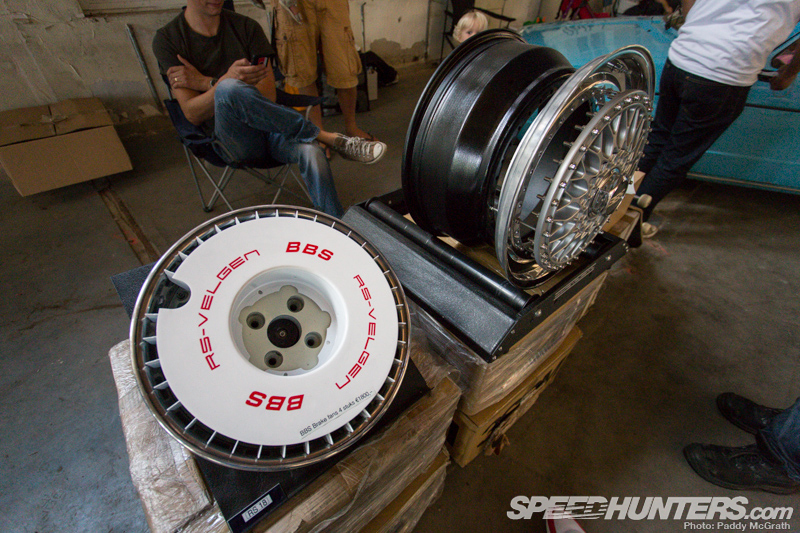 I may have been transfixed by the BBS RF wheels fitted to the E36 Touring next to it. More Mercedes-Benz vintage metal – this time a beautiful W115 model. Again, we shall be bringing this in its full gold glory very soon. 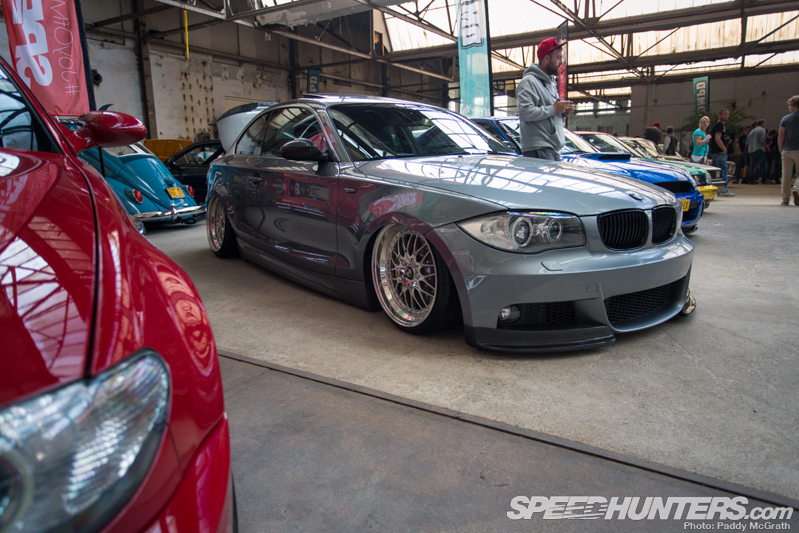 The lairy paint on this E90 BMW makes it easy to miss those new Rotiform IDK wheels on the A3. Two cars sitting next to each other that are both sure to be a talking point. 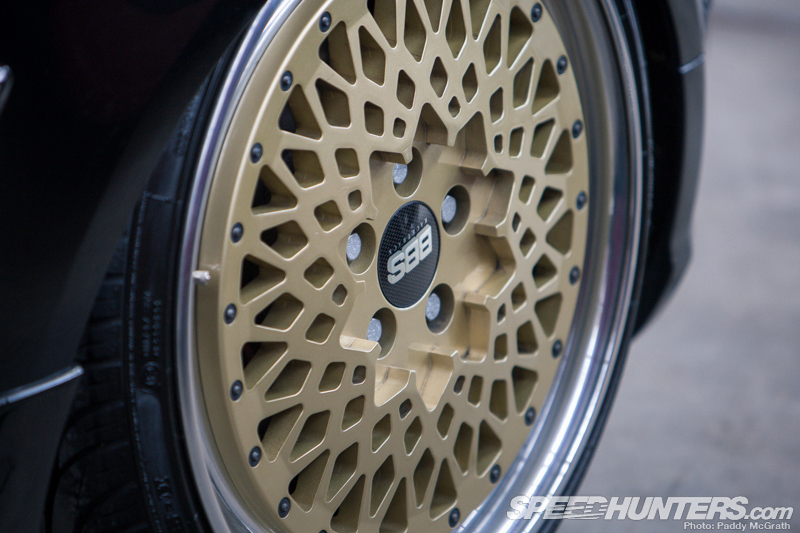 I will never get bored of looking at BBS three-piece wheels. Never. Interestingly enough, some of the success for the Rotiform brand has to be credited to the company’s passion for BBS products and its bespoke refurbishment program. Creating new wheels like the IND model that you see on this Mk V platform car above, whilst breathing new life back into old classic wheels from brands like BBS and Ronal, shows that this is a company that’s truly into the art of all things wheel related. 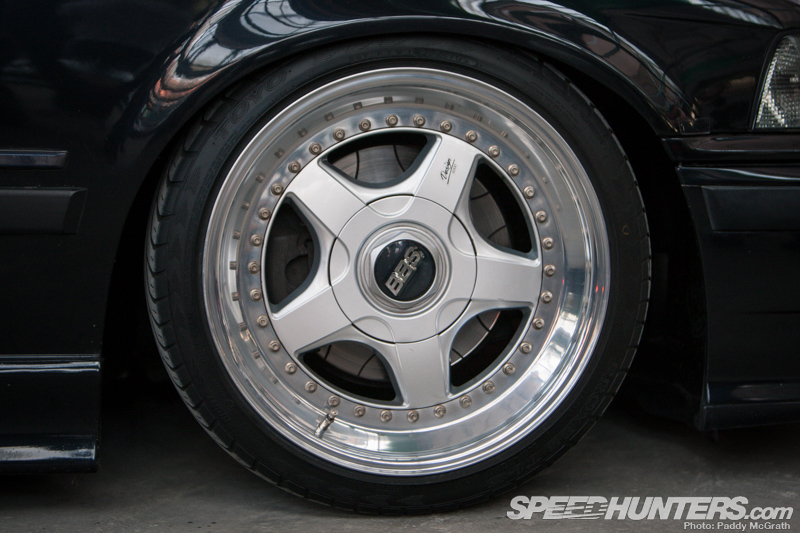 I think Paddy died a little when he saw this MkIV on BMW style 121 wheels that are usually found on the 6 Series. I love the use of BMW rolling stock on the wrong marque. It can look so very right. Speaking of wrong, I’m guessing this car wasn’t from Massachusetts. It’s definitely low, though. 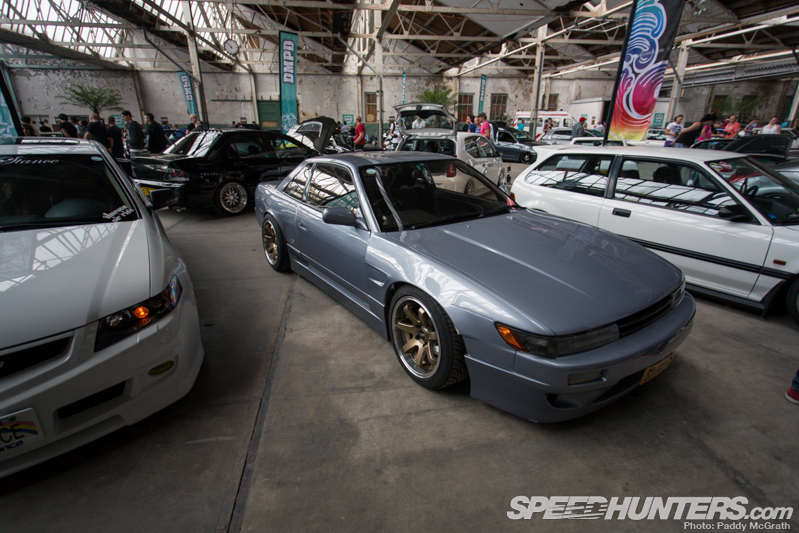 Another car I somehow managed to miss. Not so much a car, more of a truck, this Caddy looks really nice. I not sure how my eyes didn’t see some of these vehicles since I certainly didn’t have a phone to distract me! You don’t see that many of these tuned in the UK and they’re becoming quite rare now. 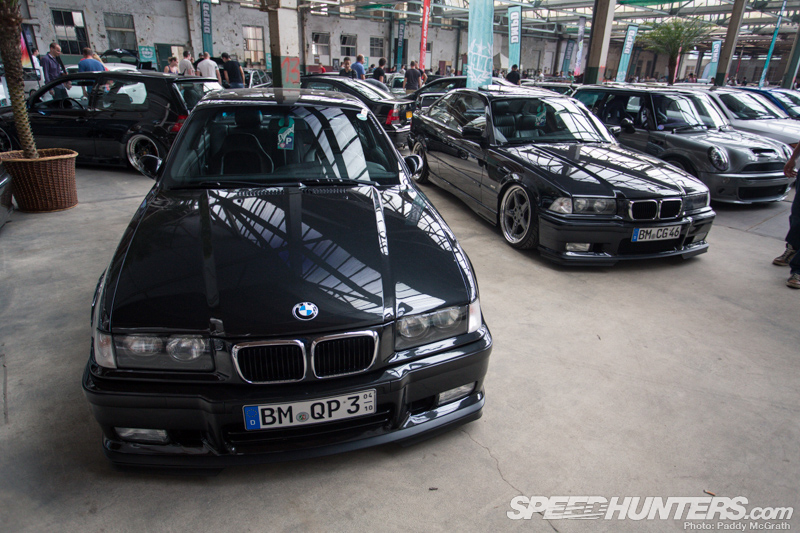 More of the E36 Touring I was getting excited about earlier. I think I need a set of RFs in my life. Another car I’ve longed for is the VW Corrado. 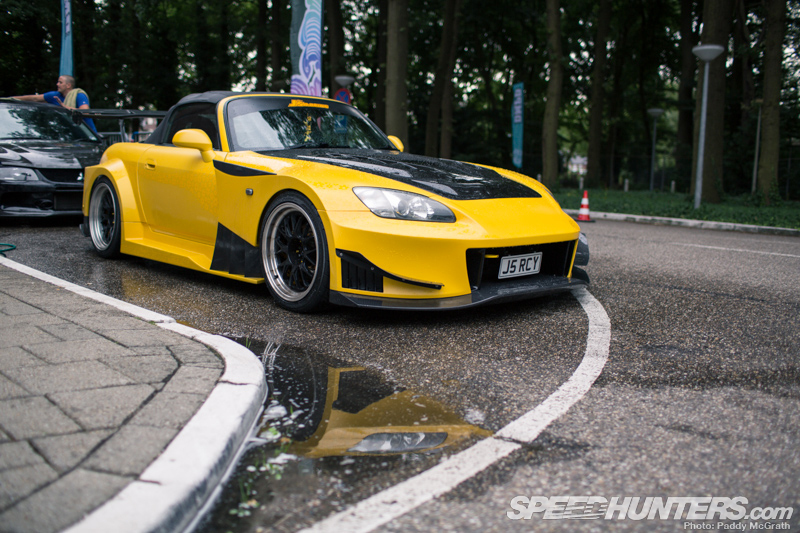 This particular car – the subject of a Spotlight back in 2010 – is running ultra-low coilovers and a side exit exhaust. Pretty incredible considering this is its driving height! … with lots of variety on offer. This whole spoiler-removal thing makes me really happy. 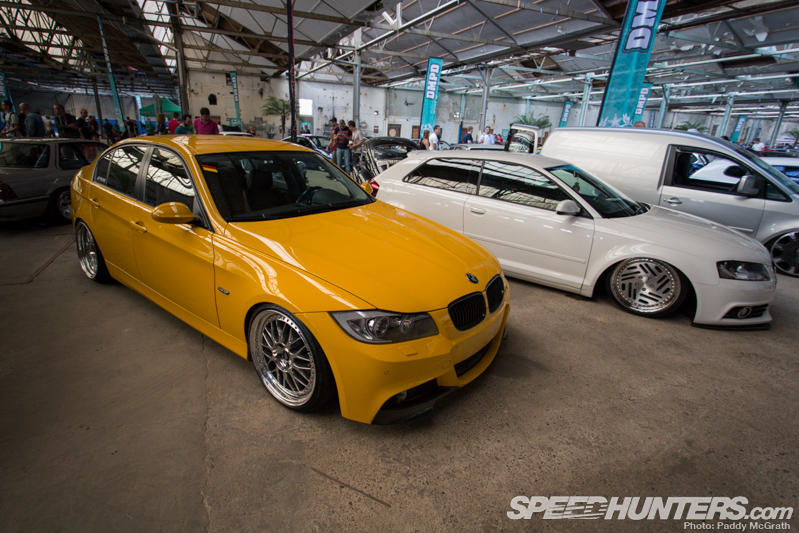 It’s only looking through these photos and putting this report together that has made me realise how many BMWs were at the event. … but the amount of Beemers was considerable. 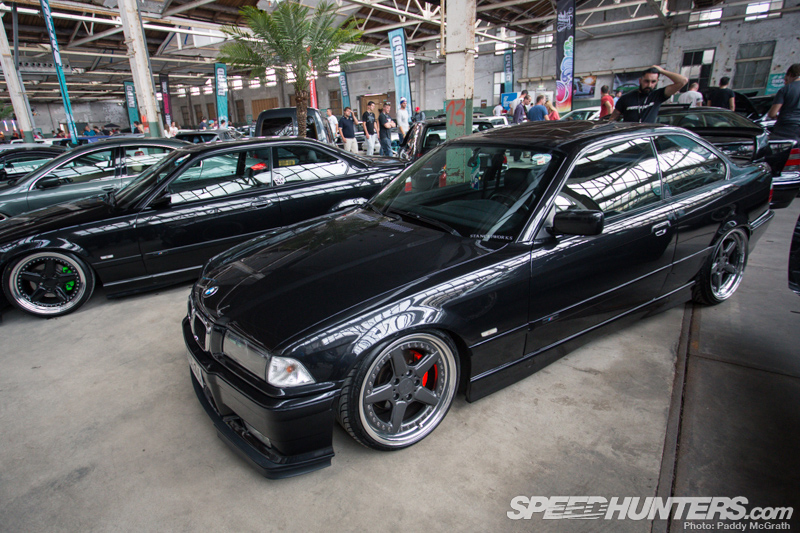 Paddy and I argued over which E36 we prefered for about five minutes before he got bored of my chat. I wanted the one on the left, whilst he said that the one on the right was better. 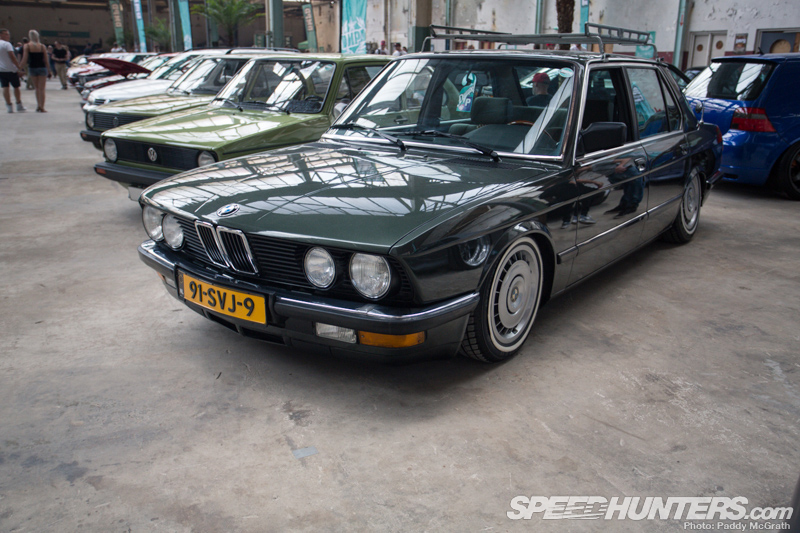 Another cool E28 chassis with a killer set of wheels. 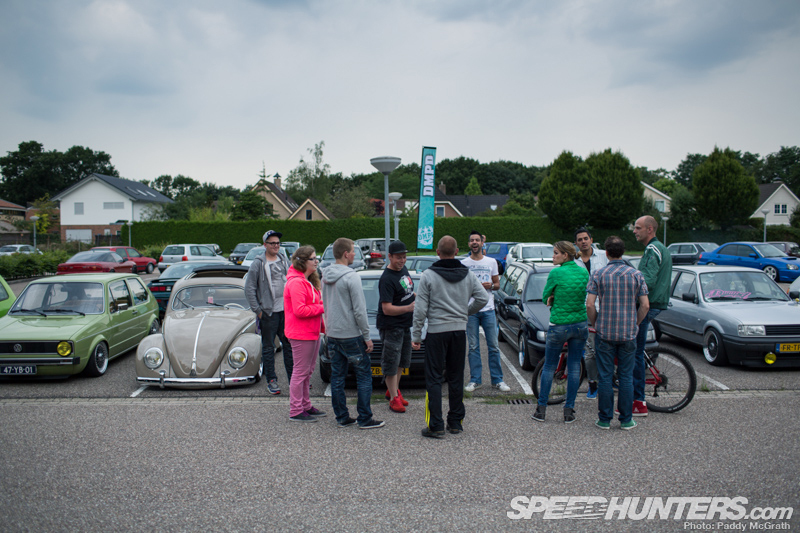 No matter how many cool Beemers I see, it will always be about Volkswagen for me. 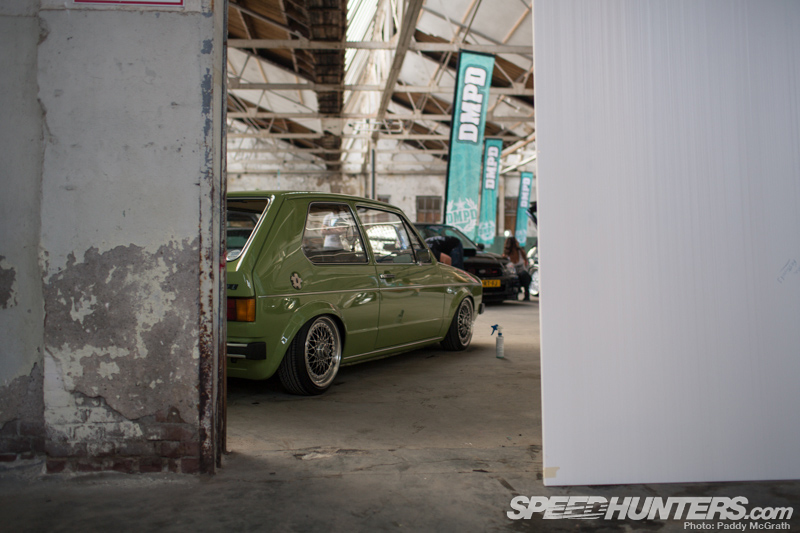 This MkI Golf bay is perfect. Not too much smoothing, just perfect with the lines and identity retained. Sometimes people can take it too far, but this is incredible. 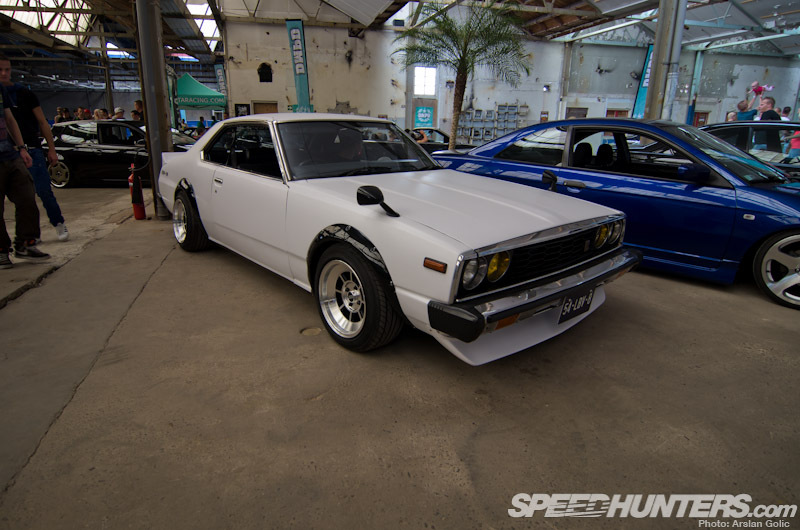 … but this Corolla was fairly understated. There’s a guy with a super-clean AE86 that lives opposite me and the sound that these things make is just lovely. Hearing it start up every morning is a good alarm! 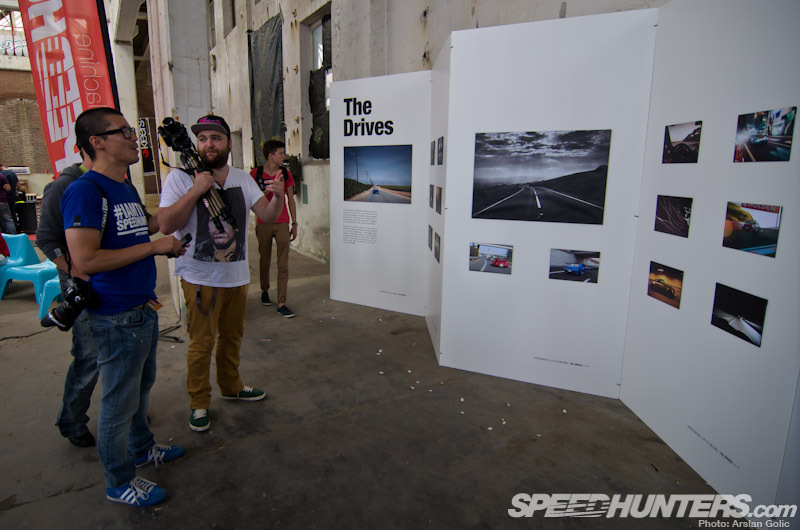 As you can see from this shot, the whole event was very chilled. I will bring you more on some of the cool cars that were inside and outside in my next DMPD post. 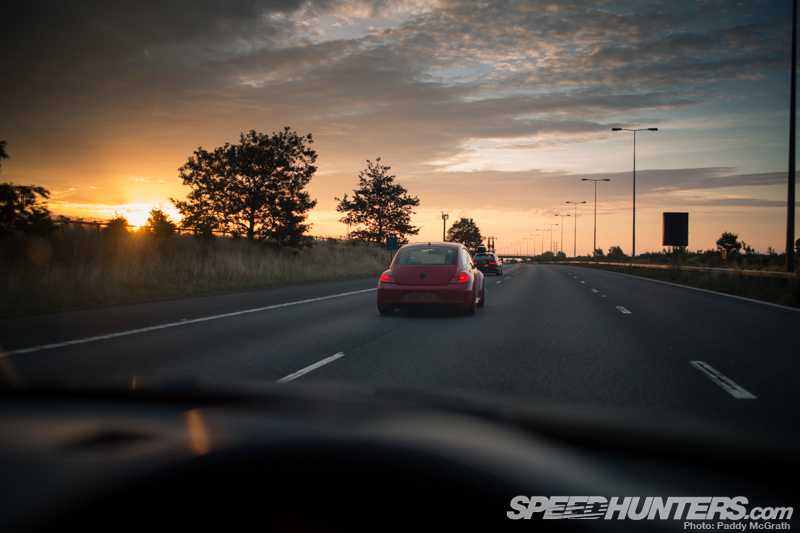 We will also be bringing you a full feature on this Beetle owned by local guy Martyn Groters, too. 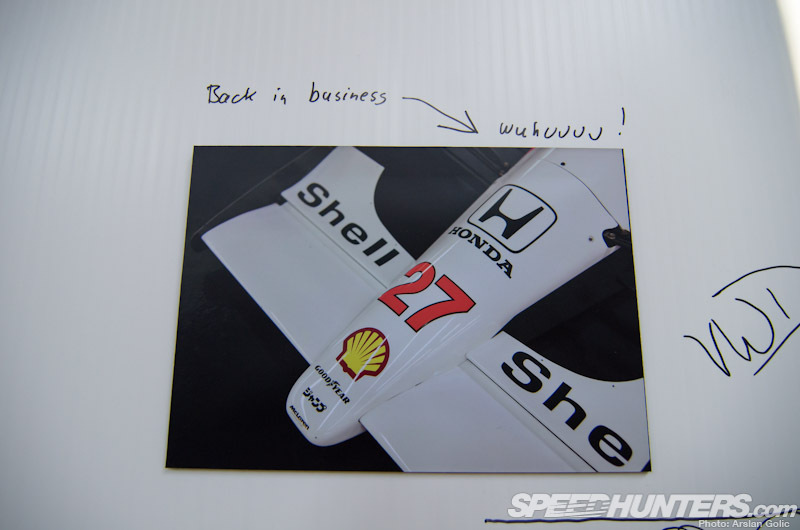 This guy left early before we got a chance to do a full shoot, but maybe next time Paddy and I will bring you a story on this car. Audi really nailed it with the A5 shape and I think that this matte blue makes the lines even better. Talking of lines, the 986, of course, borrows its styling cues from one of the most iconic automotive models ever made, the 911. These first generation Boxsters are incredibly cheap now and the chassis is awesome. 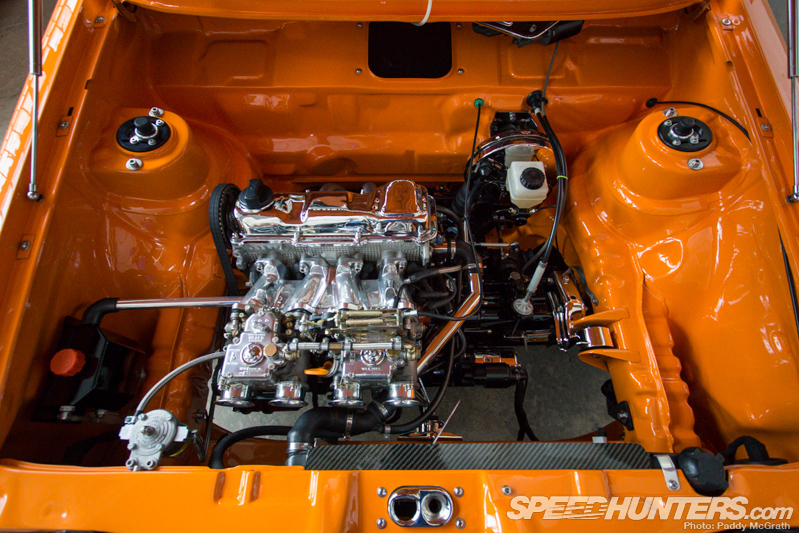 We shall be bringing you more on this build soon as well. Seeing everything and going everywhere can be exhausting, but it’s also very rewarding. I guess we will never remember those long nights of sleep we had, but pushing the boundaries of what can be achieved during a weekend will always be looked back upon. Elmo has put the time in getting to European shows this year and it’s the road trip that’s half the fun. DMPD was an awesome event that was executed perfectly. After I dropped Rod back to the airport I thought I might as well head into Amsterdam and have some lunch before driving back to London via Belgium, France and le shuttle. I had no phone and it was kind of liberating to be without it. No calls, texts or social media addiction to contend with. Being back in the UK it was pretty essential to get my phone swapped for a working handset, but whilst I waited at the Apple store I had some time to consider how very lucky we are to get in our cars and go places, see different things and hang out with friends old and new. Having a driving license is a privilege and not a right. I don’t know about you, but I spent many years wishing I was old enough to take my test. So it makes sense to maximise this privilege you’ve earned. Next time you’re heading to a show, meet or any event, why not be spontaneous and go for a drive somewhere unplanned… Somewhere you’ve never been before? It’s not so much the destination, but the adventure you have along the way that makes events like DMPD so good.